Promojay is real estate developer in Saint Martin de Belleville since the start of the village resort in 1986. Located at 1450 m altitude, Saint Martin was for a long time the guardian of traditions. Today, Saint Martin, has built an image of village resort, without losing anything of its original identity. In addition to its authentic charm, Saint Martin de Belleville is an integral part of the 3 Valleys area. In winter, it is a paradise for board sports: alpine skiing, snowboarding, cross-country skiing, off-piste skiing … 600 km of marked trails served by 200 lifts. The 3 Valleys domain also gathers alone a number of unique stars in the mountains: 21 for 12 gourmet restaurants… so many gourmet stops to discover! Skiing, gastronomy and alpine mountain panorama, a unique way of life: is not it a fabulous triptych? Saint Martin has kept the traditional architecture of the mountain village, integrating new wood and stone constructions in the old Savoyard houses. In this warm setting, the resort offers many local services, as well as winter and summer activities. Finally, Saint Martin de Belleville is of course a tourist resort, but also a real charming village that lives all year. Then RN90 to Moûtiers, then D117 for 20 km to Saint Martin de Belleville. Moûtiers station: TGV links with Brest, Le Havre, Lille, Nantes, Paris, Versailles, Poitiers, Tours, Quimper, Rennes, Rouen, Cherbourg, Brussels by Thalys and London by Eurostar. 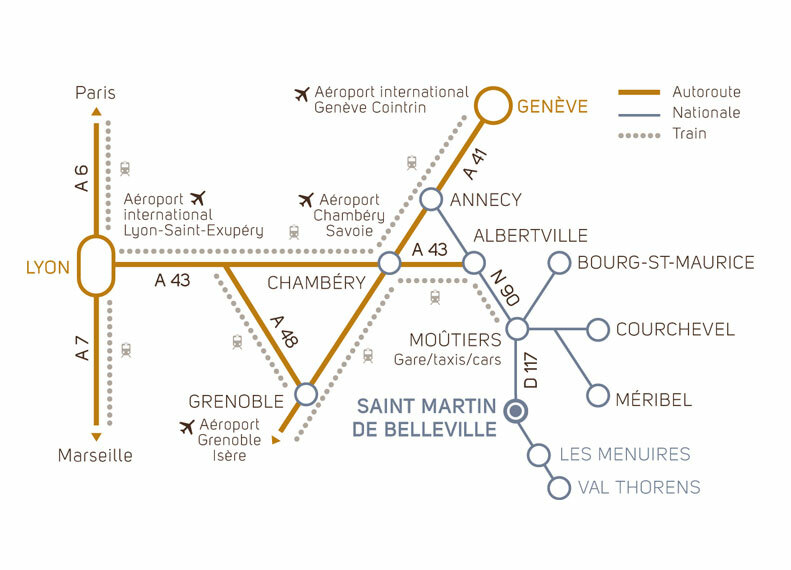 International airports: Geneva, Lyon Saint-Exupéry and Chambéry Savoie.